The private spaceflight company SpaceX has officially setFriday as the target date for the launch debut of its new Falcon 9 rocket. The new commercial rocket, designed to haul cargo to theInternational Space Station, may one day also carry astronauts to Earth orbit. Space Exploration Technologies (SpaceX) of Hawthorne,Calif., planned to roll out Falcon9 today to its dedicated seaside launch pad at Cape Canaveral Air ForceStation in Florida. The rocket has a four-hour window in which to launch,starting at 11 a.m. EDT (1500 GMT). If weather or some other obstacle preventsthe test from taking place Friday, SpaceX can try again on Saturday. Both days have about a 60 percent chance of favorableweather, forecasters predict. Cumulus clouds and anvil clouds fromthunderstorms could prevent the launch. The one major hurdle left before the fledgling rocket can attemptto launch is final approval of its flight termination system (FTS), anexplosive charge that would destroy the rocket if it flew off course. BothSpaceX and the U.S. air force, which monitors the launch area, must beconfident that the system works before Falcon 9 can lift off. "We are now looking good for final approval of the FTSby this Friday, June 4th, just in time for our first launch attempt,"SpaceX officials said in a Tuesday statement. This test version of Falcon 9 will carry a mockup ofSpaceX's Dragon capsule, which is designed to carry cargo, and eventuallyhumans, to the International Space Station. This SPACE.comgraphic shows how SpaceX's Falcon 9 and Dragon stack up to other rockets. NASA has already awarded SpaceX a $1.6 billion contract touse Falcon 9 and Dragon to haul cargo to the station starting in 2011. If allgoes well on the first test launch, real cargo will fly atop the second Falcon9 flight, the company has said. This testlaunch has been held up by the approval process and by a crowded range. 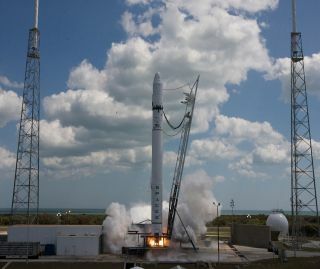 Thesuccessful launch May 27 of a GPS satellite cleared up a window for SpaceX toproceed. The company said its expectations are not set too high forthis first effort to run through a complete countdown and launch of the 178-foot(54-meter) tall rocket. "Since this is a test launch, our primary goal is tocollect as much data as possible, with success being measured as a percentageof how many flight milestones we are able to complete in this firstattempt," SpaceX said in the statement. "It would be a great day ifwe reach orbital velocity, but still a good day if the first stage functionscorrectly, even if the second stage malfunctions. It would be a bad day ifsomething happens on the launch pad itself and we're not able to gain anyflight data."